Once your doctor decides a daily aspirin regimen is good for you, its safe use depends on following your doctor’s directions. There are no directions on the label for using aspirin to reduce the risk of heart attack or clot-related stroke. You must rely on your health professional to provide the correct information on dose and directions for use. Using aspirin correctly gives you the best chance of getting the health benefits with the fewest unwanted side effects. Discuss with your health professional the different forms of aspirin products that might be best suited for you. Aspirin has been shown to lower the risk of heart attack and stroke, but not all over-the-counter pain and fever reducers do that. Even though the directions on the aspirin label do not apply to this use of aspirin, you still need to read the label to confirm that the product you buy and use contains aspirin at the correct dose. Check the Drug Facts label for “active ingredients: aspirin” or “acetylsalicylic acid” at the dose that your health professional has prescribed. Remember, if you are using baby aspirin everyday for weeks, months or years to prevent a heart attack, stroke, or for any use not listed on the label - without guidance from your health professional - you could be doing your body more harm than good. You can increase the chance of getting the good effects and decrease the chance of getting the bad effects of any medicine by choosing and using it wisely. When it comes to using aspirin to lower the risk of heart attack and stroke, choosing and using wisely means: Know the facts and Work with your health professional. Aspirin has been shown to be helpful when used daily to lower the risk of heart attack, clot related strokes and other blood flow problems. Many medical professionals prescribe aspirin for these uses. There may be a benefit in daily aspirin use for you if you have some kind of heart or blood vessel disease, or if you have evidence of poor blood flow to the brain. However, the risks of long-term aspirin use may be greater than the benefits if there are no signs of, or risk factors for heart or blood vessel disease. Every prescription and over-the-counter medicine, has benefits and risks -- even such a common and familiar medicine as aspirin. Aspirin use can result in serious side effects, such as stomach bleeding, bleeding in the brain, kidney failure, and some kinds of strokes. No medicine is completely safe. By carefully reviewing many different factors, your health professional can help you make the best choice for you. If you are at risk for heart attack or stroke your doctor may prescribe aspirin to increase blood flow to the heart and brain. But any drug, including aspirin, can have harmful side effects, especially when mixed with other products. In fact, the chance of side effects increases with each new product you use. New products includes prescription and other over-the-counter medicines, dietary supplements, (including vitamins and herbals), and sometimes foods and beverages. For instance, people who already use a prescribed medication to thin the blood should not use aspirin unless recommended by a health professional. There are also dietary supplements known to thin the blood. Using aspirin with alcohol or with another product that also contains aspirin, such as a cough cold- sinus drug, can increase the chance of side effects. Your health professional will consider your current state of health. Some medical conditions, such as pregnancy, uncontrolled high blood pressure, bleeding disorders, asthma, peptic (stomach) ulcers, liver and kidney disease, could make aspirin a bad choice for you. 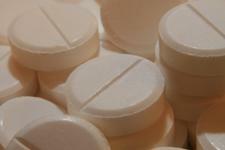 Low-dose aspirin, taken regularly, cuts the risk of a heart attack. Aspirin makes it harder for blood cells called platelets to form clots that can block arteries which feed the heart. At least, that was shown in men. But a major study found recently that, while aspirin reduced stroke risk in women, it did not reduce heart attack risk. Researcher Diane Becker of Johns Hopkins looked at whether aspirin worked the same way in women. Her study, which was supported by the National Institutes of Health, was in the Journal of the American Medical Association. Becker suspects women may need higher doses to reduce their heart risk. She says women should keep taking aspirin. Prescription aspirin is used to relieve the symptoms of rheumatoid arthritis (arthritis caused by swelling of the lining of the joints), osteoarthritis (arthritis caused by breakdown of the lining of the joints), systemic lupus erythematosus (condition in which the immune system attacks the joints and organs and causes pain and swelling) and certain other rheumatologic conditions (conditions in which the immune system attacks parts of the body). Nonprescription aspirin is used to reduce fever and to relieve mild to moderate pain from headaches, menstrual periods, arthritis, colds, toothaches, and muscle aches. Nonprescription aspirin is also used to prevent heart attacks in people who have had a heart attack in the past or who have angina (chest pain that occurs when the heart does not get enough oxygen). Nonprescription aspirin is also used to reduce the risk of death in people who are experiencing or who have recently experienced a heart attack. Nonprescription aspirin is also used to prevent ischemic strokes (strokes that occur when a blood clot blocks the flow of blood to the brain) or mini-strokes (strokes that occur when the flow of blood to the brain is blocked for a short time) in people who have had this type of stroke or mini-stroke in the past. Aspirin will not prevent hemorrhagic strokes (strokes caused by bleeding in the brain). Aspirin is in a group of medications called salicylates. It works by stopping the production of certain natural substances that cause fever, pain, swelling, and blood clots. How Should Aspirin be Used? Prescription aspirin comes as an extended-release tablet (tablet that releases medication slowly over a period of time). Nonprescription aspirin comes as a regular tablet, an enteric-coated, delayed-release tablet (tablet that first begins to release medication some time after it is taken), a chewable tablet, powder, and a gum to take by mouth and a suppository to use rectally. Prescription aspirin is usually taken two or more times a day. Nonprescription aspirin is usually taken once a day to lower the risk of a heart attack or stroke. Nonprescription aspirin is usually taken every 4 to 6 hours as needed to treat fever or pain. Follow the directions on the package or prescription label carefully, and ask your doctor or pharmacist to explain any part you do not understand. Take aspirin exactly as directed. Do not take more or less of it or take it more often than directed by the package label or prescribed by your doctor. Click-here for Health Tip-of-the-Day. What should I do if I Forget a Dose of Aspirin? What Side Effects can Aspirin Cause? If you experience a serious side effect, you or your doctor may send a report to the Food and Drug Administration's (FDA) MedWatch Adverse Event Reporting program online or by phone 1-800-332-1088. What Storage Conditions are needed for Aspirin? Keep this medication in the container it came in, tightly closed, and out of reach of children. Store it at room temperature and away from excess heat and moisture (not in the bathroom). Store aspirin suppositories in a cool place or in a refrigerator. Throw away any medication that is outdated or no longer needed and any tablets that have a strong vinegar smell. Talk to your pharmacist about the proper disposal of your medication.